A rich and creamy pudding recipe that is dairy, gluten, and egg free! Best chocolate pudding in the world. 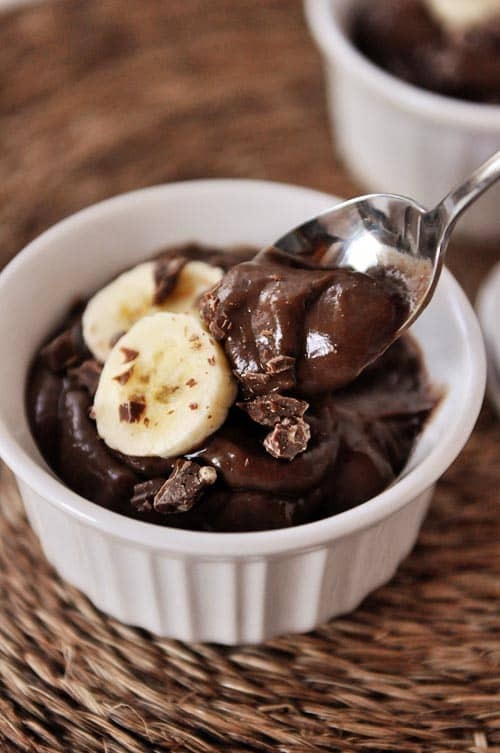 And definitely the best vegan chocolate pudding EVER! (*statistic not based on actual research). b) for a decadent, rich chocolate pudding, the indulgence comes a little bit lightened up which is a lovely bonus. c) if you haven’t tried dark chocolate almond milk, you must, you absolutely must. To be clear, we don’t have food allergies in our home, but that doesn’t mean I can’t enjoy some dark chocolate almond milk just like my dairy-free friends. A cup of this creamy nectar is balm to my soul. And so much better (in taste and calories) than the other plastic jug chocolate milk varieties. I’m not kidding – this is a staple in my fridge. After a few months of loving this plain and simple, I decided the obvious next step would be to make chocolate pudding. Since I knew it would be dairy free, I decided to go for an egg-free version, too. I wish I could say it was because I love my egg-free friends just as much as my dairy-free friends, but really, it was because I was out of eggs. Can we pretend it’s because I’m altruistic and selfless? Thanks. The result ends up being one of the tastiest chocolate puddings ever. Even though it’s lightened up a bit, it’s thick and creamy and completely luxurious. Try slicing a few bananas over the top. Oh, yum. You can see from the pictures that I also decided to toss a few chopped Toblerone pieces across the top too. Because…well…why not? I’m sorry if this recipe and/or post causes a dark chocolate almond milk addiction on your part, too. We can enter therapy together. Update: So I couldn’t resist trying a non-peanut butter version today (2/22/14) for all of those who asked about omitting it. Here’s the result: the cooked and chilled pudding without the peanut butter was really good! It was definitely missing that element of creaminess the peanut butter gives, but honestly, I loved it. It wasn’t quite as thick as the peanut butter version so I would suggest upping the cornstarch to 2 1/2 or 3 tablespoons if you are leaving out the peanut butter. Remember to let it boil and bubble (stirring constantly!) for a good 2-3 minutes to help it get as thick as possible. It will still be slightly runny when pouring into a bowl but will thicken up considerably upon chilling. In a medium saucepan, whisk together the sugar, cocoa powder and cornstarch. Slowly pour in the almond milk and whisk to combine. Cook over medium heat, whisking constantly until the pudding begins to bubble. Cook two minutes longer (while it boils and bubbles). The mixture will be thick but pourable and will set up more while it chills. Take the saucepan off the heat and whisk in the peanut butter and vanilla. Pour the pudding into a bowl and cover with plastic wrap, pressing directly to the surface to avoid a skin forming. Refrigerate until well-chilled, 3-4 hours. Serve with sliced bananas (optional). I also sometimes sprinkle chopped Toblerone bars on top, too. Just because I can...and it's amazing. The pudding is already egg-, dairy- and gluten-free. For my peanut-free friends, try subbing in soy butter or sun butter for the peanut butter. ﻿As noted above in the post, I couldn't resist trying a non-peanut butter version today (2/22/14) since many of you asked about it. Here's the result: the cooked and chilled pudding without the peanut butter was really good! It was definitely missing that element of creaminess the peanut butter gives, but honestly, I loved it. It wasn't quite as thick as the peanut butter version so I would suggest upping the cornstarch to 2 1/2 or 3 tablespoons if you are leaving out the peanut butter. Remember to let it boil and bubble (stirring constantly!) for a good 2-3 minutes to help it get as thick as possible. It will still be slightly runny when pouring into a bowl but will thicken up considerably upon chilling. This is truly delicious! I found out that I can no longer have dairy… cue weeping and gnashing of teeth and severe cheese withdrawals . ALL of my recipes are full of cheese, butter, and cream… because yum. I have been lamenting, especially, the end of my beloved chocolate desserts, BUT Mel! You have saved me this recipe! I make a large batch once a week and it cures my chocolate craving. It is so so good! I tried it without peanut butter, but to me it’s 10-stars with the addition of peanut butter. Absolutely delicious, thank you so very much for this recipe! This pudding is scrumptious! Made it for the Super Bowl Party and everyone loved it! Would natural peanut butter work or does it have to be the conventional kind? If the natural kind you use is on the creamy side, I think it will work. I’m allergic to dairy and peanuts. My dairy allergy was just recently diagnosed. I’ve been missing so many desserts especially chocolate pudding and cookies. I read this recipe and got up off the couch and made it. I am almost in tears it’s so good. SO GOOD. I substituted almond butter. I ate it hot right after I poured it. Licked all the spoons and would haves licked the pan if it wasn’t still hot. Bless you. I will be making this a lot. Have you or anyone made this sugar-free? I’m diabetic & usually buy store bought Jello Cook & Serve sugar-free, fat=free chocolate pudding. This pudding is TO DIE FOR. I was recently diagnosed with IBS and the 2 biggest items that make me sick are gluten and lactose. I’ve been finding it so frustrating to find items that I used to enjoy but that are allergy friendly. My husband this year wanted a dirt pudding “cake” and I was determined to find a way to make what he wanted but that I could enjoy as well. This recipe is amazing. I’m not a huge fan of peanut butter so I just used extra cornstarch. I am also not a fan of any nut milks or soy milk so I used our favorite lactose free chocolate milk from Fairlife. This pudding turned out so great that my husband prefers it to store bought and he was so happy with his pudding “cake!” Thank you so much for sharing this recipe!! I made this pudding tonight for dessert when we had a guest for supper, and everyone loved it! Looks amazing! Have you tried with any other milk like coconut or cashew? Also would you be able to substitute almond butter or cashew butter instead of peanut butter? My child is allergic to peanut, eggs and dairy. Would love to make this if possible. Thanks Mel! I know, Beth, right??? This stuff is amazing! So happy you liked it! i carry epi-pens. NO peanut butter for me. please help!!!!! Renee, my son is severely allergic to peanuts as well. I am going to try this recipe with Sunbutter. It is made from sunflower seeds. It is very good, has the same texture and peanut butter and best of all, is not even processed on the same machinery as peanut butter. I used to have problems finding Sunbutter but most grocery stores around me carry it now. Trader Joes also carries it. This was the perfect way to use up some of my almond milk! I only had the plain unsweetened kind, so I increased the cocoa to 3 tablespoons. Later, as I was stirring it, I thought it didn’t smell chocolatey enough, so I threw in about 1/3 bag of semisweet chocolate chips along with the peanut butter at the end. I also didn’t have cornstarch, so I used 3 tablespoons of flour instead, and it thickened beautifully (the peanut butter also helps with that). The pudding is delicious, and I will definitely be making it again. Thanks so much, Mel! Thanks for the recipe , its looks awesome! I just have a question. Do you know if the corn starch can me replace for other ingredient? or, It is possible not to use it at all? I would really appreciate if you could help me with that doubt. I’m not sure, Leonora – you might read through the comments to see if others have had good success subbing something for the cornstarch. Tapioca starch can be substituted for corn starch. I just made this for my egg and dairy allergy child, of course he will have to share with the rest of us. It’s in the fridge setting up. I am super excited about this, as I could use a Graham cracker crust and some coconut milk whipped cream, which is yummy, and make a pie that he could have! Thanks! This tasted and looked great! Everything happened thickening-wise just as the recipe said. Thanks for sharing. Note to others: I didn’t have chocolate almond milk and don’t like a lot of sugar in my stuff so I used my slightly sweetened (5g of sugar) organic plain almond milk and some dark chocolate cocoa powder and it worked great! It even looked the same color as the picture. Keep in mind, I don’t like my stuff as sweet as most do so if you are wanting to use plain almond milk instead of chocolate almond milk, add some more cocoa powder and sweetness. So yummy! I used soy butter in place of peanut butter, and it turned out amazing! I will definitely be making again. I just made the pudding, using regular (not dark) chocolate milk and creamy almond butter in lieu of peanut butter. I only tasted it while warm, but it’s delicious!. My grandson is severely allergic to dairy and eggs, but not nuts, so this is perfect! He loves Keebler’s graham cracker pie crust, and the recipe makes almost enough to fill it. I was thinking it would be good topped with fresh raspberries or even cherry pie filling. I’m letting it cool while he’s in pre-school, but I predict it’s going to be a hit! Great pudding. I’m going to try with coconut oil vs peanut butter. Curious if anyone has tried almond or other nut butters? Thanks. I made this tonight with the help of my 5 year old daughter, who is allergic to dairy, egg, and almond. We substituted with chocolate soy milk and skipped the peanut butter because I was in a hurry and hate measuring out PB. It was very close in color and consistency, and even flavor, to the boxed Jello pudding I made for the rest of the kids. (I’ll skip that next time and just make a bigger batch of this!) We made dirt cups with the traditional gummy worm. I’ve never made pudding before, but this was amazingly good and SO easy! My little girl had her first experience with pudding, and I’m so bappy! Thank you for posting this!! I just made this last night and loved it. However, it seemed to have a weird grainy texture to it. Might that be because of the peanut butter? Also, mine was fabulous but my husband was complaining about chunks in his. I finally got a big one at the end. I’d love to try making this again but hesitate to have it turn out bad again. Hi Michelle – did you use natural peanut butter? That might contribute to the graininess – I usually use a traditional creamy PB for this recipe (like Jif). Also, the chunks are probably there if the pudding was cooked at too high of a heat. You might try lowering the heat on the stove and cooking it more slowly (and you can always strain the pudding after cooking through a fine mesh strainer after to get rid of any hard bits). I just have regular almond milk, should I just add more cocoa powder to get the same chocolate taste? How much more should I add? I’m not sure – I haven’t tried it with regular almond milk but I’m pretty sure others in the comment thread have done that so you might read through to see what their experience was. Good luck! Mel…I made this pudding last night with great success! It was delicious and nice to be able to offer a dairy free/egg free/gluten free dessert. I added whipped Coconut Cream on top and it was delicious. Thank you for a great recipe. My grandson is severely allergic to dairy and eggs. I had just purchased a half gallon of chocolate almond milk, and wondered if it was possible to use it to make pudding. I followed your recipe without nut butter and used 2 1/2 Tbs. of cornstarch. At the end of the cooking time, I added a couple of tsps. of Earth Balance vegetable spread. I found it added a little bit of extra body and smoothness to the pudding. It turned out beautifully! Thank you so much for this recipe! My daughter is gluten intolerant and had to have chocolate pudding with oreos for dinosaur day at school. I actually made this with chocolate hazelnut milk, since my husband has an almond allergy. It was fantastic! Now we are all eating this with bananas and gluten free “oreos”. You made my daughters day! Is it possible to make this without using chocolate? This recipe looks heavenly…. But I just have to have to be allergic to chocolate…. I haven’t updated it to be chocolate free so I’m not sure of the substitutions/amounts but you could certainly experiment. Holy cow! I tried this tonight and it is amazing! I wasn’t sure I wanted a peanut butter chocolate pudding, so I left out the peanut butter and used 3Tbs of cornstarch and it thickened beautifully (actually, I doubled the recipe). I usually shop at a small military commissary where they don’t carry the dark chocolate almond milk, so I went out of my way to find some for this recipe and boy, am I glad I did! I prefer stove-top pudding to boxed instant pudding and I liked not having to use egg yolks in this recipe. I also admit that I like the pudding skin that forms on the top, so I’ve let it chill in the fridge without a cover. Additionally, I’m allergic to all fruit (raw or cooked), so I’ll be leaving the bananas off the top (though they look fantastic). I’ll try the peanut butter version of this at some point, but count me as a permanent fan of the chocolate-only version of this! Thanks for posting! Made this tonight for company and it was UNBELIEVABLE! First of all, it could not be easier to make. I really don’t think the box mix is any easier. And, the taste cannot be beaten. Super creamy, super chocolatey, super rich. I used almond butter in place of the peanut butter b/c we have a peanut allergy in the family and I really loved it. Recipe doubled nicely and serving it with banana slices is a perfect accompaniment. So delicious, Mel! This looks delicious! I love the dark chocolate almond milk too — in fact, I’m currently drinking a smoothie I just whipped up with it, 1 cup chocolate almond milk, 1 banana, 2 Tbs Nutella and some ice! Try it, you must!!!! Rebecca – that sounds amazing! Totally making it this afternoon! I am glad you shared this with us & I am loving your allergy free recipe tab.I just got diagnosed with a dairy allergy last year and it has been a struggle to cook dairy free for me while still allowing my family to enjoy their old favorites. I can’t wait to try this! Indulgences like this help me to not feel deprived. Wonderful! I made a second batch with Nutella and it is AMAZING! I’ve tried this three ways now – with Kirkland Natural Peanut Butter, with Skippy Creamy, and with no peanut butter. The winner for me is Skippy. The natural peanut butter has a slight grit to it that affects “mouth feel” of the pudding. The no-peanut butter version is good, but the Skippy version is a game-changer. We’re having crepes for dessert tonight, and I’m offering both the skippy and no- peanut butter versions as fillings. Bon appetit! Hi Mel- I made this just now. It is still hot but I tasted it from the spoon and it was delish! -can’t wait till it cools. I found the milk on sale this am while shopping,, and it was in the back of my mind that I wanted to try this. It will be so nice to have a somewhat healthier dessert. I’m guilty of “The Famous Box” pudding, but I know it is just a witch’s brew of chemicals that aren’t that good for us and give it a commercial taste. My cooking just keeps on improving, Thanks to You! This turned out like .what a Reese’s chocolate pudding would be. This was really good! I usually try and sub low fat milk in pudding recipes, and then they don’t thicken up well. This, however was so thick and creamy! My whole family loved it! We put some chopped up peanut butter cups on top to make it even a little more chocolate/peanutbuttery…yum! Thanks Mel! Can you substitute brown sugar for white sugar in this recipe? Jordana – It’s worth a try but I haven’t tried it so I don’t know how it would affect texture/outcome. You did this just for me, didn’t you? My mouth started watering the minute I saw the photo and saw no dairy. I did a little change and used honey instead of sugar and it turned out delish. Thank you for looking out for us vegans and those with allergies. Not gluten free….no allergies. This was to die for. I am so amazed at how tasty this is. Going to feed it to the hubby and then tell him what is in it. Well done Mel! I used leftover pudding thinned out with a little more almond milk to make frozen pudding pops! I also added chia seeds and flax meal to boost nutrition and just blended it all together. Yummy! I have chocolate soy milk in the fridge, perhaps I’ll try it with that! Dark Chocolate Almond Milk is one my favorite “treats” to have each day. I’m wondering you can use natural peanut butter in this, or is too runny? Suzanne – I haven’t tried natural peanut butter so I don’t know for sure but I definitely think it is worth a try. Another winner! I made it for the second time yesterday with Nutella rather than peanut butter and it’s delicious!! I am always so excited to find dairy free treats. Thank you, this pudding looks delicious! Our family is blessed to have no food allergies, but I made this last night, doubled it for our family of 6, and we licked the bowl clean!! So yum! Thanks Mel! Yum! I’ve been craving pudding lately but can’t bring myself to buy instant. 😉 I usually buy vanilla almond milk but today I splurged on chocolate to make this! This looks pretty amazing! My husband is fairly lactose intolerant, my brother in law is vegan and one of my best friends is allergic to soy, eggs and dairy, so this will be a real winner. Okay, I think I live in a smaller little town than you–if you can believe it, and my one small grocery store had this milk! I am excited to make it and have it tonight for FHE treats! Thanks Mel! You rock! Made this before church today and couldn’t wait to get home and try it. We LOVED it!!!! Such a great flavor and texture!!! Thank you. Wondering what brand of cornstarch you use. Most of what’s can find easily is not gluten free. This would be a perfect dessert for a dinner party as one of our friends is gluten egg and dairy free it I would need to be able to source gluten free cornstarch. 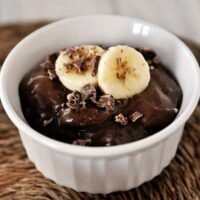 Hi Mel – I”m curious how you think this compares to your other chocolate pudding recipe? I was already planning on making pudding this coming week and just trying to decide which recipe to use 🙂 I’m guessing this is lower calories….? Nicole – both are really delicious. This one has a bit of a different texture and I guess I love both for different reasons. I haven’t calculated the nutrition info, but yes, this one is most likely less calories and fat, especially if you leave out the peanut butter. Hey everyone – I couldn’t resist trying a non-peanut butter version today (2/22/14) since many of you asked about it. Here’s the result: the cooked and chilled pudding without the peanut butter was really good! It was definitely missing that element of creaminess the peanut butter gives, but honestly, I loved it. It wasn’t quite as thick as the peanut butter version so I would suggest upping the cornstarch to 2 1/2 or 3 tablespoons if you are leaving out the peanut butter. Remember to let it boil and bubble (stirring constantly!) for a good 2-3 minutes to help it get as thick as possible. It will still be slightly runny when pouring into a bowl but will thicken up considerably upon chilling. I’ve updated the recipe with those notes! Hi Mel-Just wanted to tell you that I made this pudding last night to have today and OMG it is BEYOND delicious. As luck would have it, I had purchased the dark chocolate almond milk earlier this week. My kids have been having a glass or two here and there. And while I do enjoy almond milk and it is a staple in our house, I never thought of making a pudding out if it! It is so rich and creamy and the addition of the peanut butter has such a depth of flavor without being overly peanut-buttery. Divine!!! Can’t say enough good things about it. Thank you for sharing this recipe. It will become one I make frequently! I made this today after commenting yesterday, and it is fabulous and so creamy. I used my good Williams-Sonoma italian dutch processed cocoa powder, which I reserve for a special treat, since it is expensive–I loved the dark, rich flavor. I was worried about a real almond flavor coming through, but it was really more chocolate/peanut butter. Such a great taste combination and very easy to make. Next time I will double the recipe so we can have enough for two days. How do you come up with these amazing creations? Thanks for a great winter pick-me-up treat! Teresa – I am glad you liked it! I agree, the chocolate and peanut butter shine more than the almond flavor. have to buy some chocolate almond milk and try it! Also, thank you for having normal recipes. It seems so many people are following crazy diet food trends… you can’t cut out entire food groups people!! This looks delicious but I’m a little put-off by the peanut butter. Although I love peanut butter, I’m not a big fan of it in desserts. Does the flavor of the peanut butter come through? If so, can it be omitted or substituted for something else without changing the creaminess or fullness of the pudding? I’m always looking for new puddings and custards and would love to try the almond milk but don’t really want the peanut buttery flavor. Hi Robin – several others have asked about leaving out the peanut butter. The PB flavor is definitely apparent so if you don’t want to use it you can try omitting it. The pudding will be less thick, though, so you might want to increase the cornstarch just a little. How did you know?! I just recently got the dark chocolate almond milk and didn’t know what to do with it (it didn’t taste all that great to me by itself). Now I know what to do! Thanks! My grandson has a nut allergy. Obviously Almond Milk would be a dangerous thing for him. Please change your note above about peanut allergies. Thanks. Hi Pam, I’ve already edited the notes about nut free…in fact that part of the post was changed yesterday right after it went live. Thanks! This sounds phenomenal. 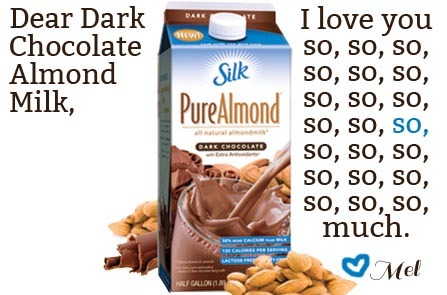 Silk Dark Chocolate Almond milk is simply the best. I just bought some earlier today at Walmart. 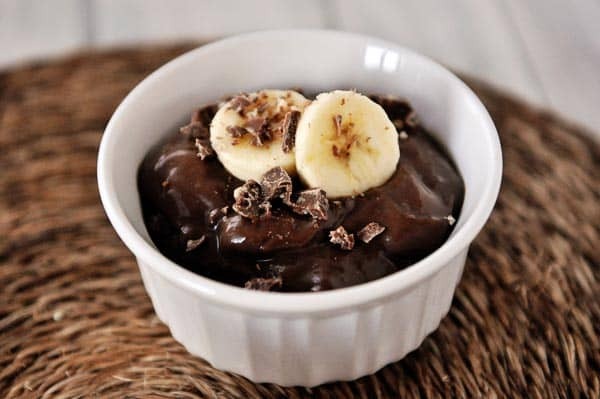 I make a great chocolate chia pudding with it but Mel’s pudding recipe sounds great. I’m going to give this a try tomorrow! As it turns out we do have all those ingredients. We tried the dark chocolate almond milk a little bit ago and have been in serious love ever since. I love that Almond Milk, but I’ve never tried the chocolate version. I’ll have to pick some up next time I’m at the store and give it a try! For those allergic to nut milks, bigger grocery stores usually carry hemp, oat, and rice milks. They would work just fine. Mmmm..dark chocolate coconut milk! Mel, if you haven’t tried that, I bet you’d love it too! Looks yummy! By the way…. I have a friend with a nut allergy but does eat almonds…..yes, peanuts are legumes so safe for her & she did not realize she could eat almonds until she was an adult. Her dr. informed her that almonds are from the peach family. So those deprived all their lives might want to check it out! Have you heard of this before?? 😉 Thanks for your help! You mentioned subbing soy butter or sun butter for the peanut butter…What about subbing almond butter instead? I’m allergic to peanuts and I’m not a fan of either of those but love almond butter….??? Melissa – I think almond butter could work great – haven’t tried it myself but if it is similar in texture to PB, you should be good! So say one doesn’t have the almond milk on hand and set person can’t run to the store today but desires to make such a delightful dessert could you use just make your own chocolate milk? And same measurements? ooooooh…. I have to try this- because I’ve had that flavor of Almond milk and it’s like liquid chocolate nectar. Seriously rich and chocolatey. Yum!. My son was egg free dairy free for a year and a half. He’s back on dairy but still off eggs. Even so, I still love and collect the ‘free’ recipes just because when we had to pull him off I had NOTHING to go on. I had to throw out most our recipes and start over. I don’t want to have to do that again. My dairy free son has never had pudding! So excited to try this! We LOVE chocolate almond milk at our house too! Thanks Mel! My dairy free son is going to love this!! I always have dark chocolate almond milk in the fridge 🙂 I will probably freeze it in our popsicle molds for an “ice cream” treat too. I was wondering if it worked to make these into popsicles?? I haven’t tried that, but it sounds promising! i too fell in love the with the dark side of almond milk. If you buy the singles and put them in freezer until they are just slighly frozen and “mushed up a bit”, they are a tasty frozen treat. Is there any reason this wouldn’t work with regular chocolate milk? My three year old has to stay away from peanuts and tree nuts (almonds, pecans, walnuts, etc) so we couldn’t do the almond milk! Jennifer – definitely worth a try. I can’t see why it wouldn’t work although just based on the fact that the level of sweetness/chocolate flavor is different with each type of chocolate milk, you may need to adjust the sugar. Good luck if you try it! Gotta try this for my daughter. She has milk and egg allergy and misses out on a lot of good desserts! Thanks Mel! Costco just had samples of chocolate almond milk. I couldn’t bring myself to buy any since if I wanted chocolate milk I could just squirt some Nesquick into a glass of plain ol’ milk. This post will definitely have me buying some Chocolate almond milk. My girls loved the sample in the store too – Bonus! I know you posted this for me and my Grace. Thank you! Every time I substitute a non dairy milk in a pudding recipe that calls for eggs it turns out runny. I’m excited for this. This may be a silly question, but does the pudding have a strong almond taste? I wasn’t sure how almond-y it would be with the addition of the chocolate flavor and the peanut butter. I drink almond milk for the increased calcium, and usually buy the vanilla, which masks the almond flavor a bit. I love raw almonds, but for some reason do not love the unflavored almond milk. Oh yummy! Could you sub coconut sugar for the granulated? We try to stay away from that. Thank you for sharing this recipe. I am always looking for dairy free recipes, and I can’t wait it try this one. Both the milk and the pudding look yummy. I should try both. A pudding without dairy? Awesome! I love almond milk. This is a winner for sure! I’m happy this is my grocery shopping day, and I can add chocolate almond milk to my list. That means I can taste chocolate almond milk today and make the pudding this weekend! Thanks again for the wonderful recipes you share with us! This is why I love you, Mel…half of our family is dairy free, and one is egg free. If you say it’s good, it MUST be. I just happen to have some chocolate almond milk in my fridge, so this is going on our snow day (second one this week!) list of things to do! This look delicious! I am loving the almond milk and peanut butter in this pudding, Mel!